The griffin is a legendary creature with the head and wings of an eagle, and the body, tail, and hind legs of a lion. As the eagle was considered the ‘king of the birds’, and the lion the ‘king of the beasts’, the griffin was perceived as a powerful and majestic creature. During the Persian Empire, the griffin was seen as a protector from evil, witchcraft, and slander. While griffins are most common in the art and mythology of Ancient Greece, there is evidence of representations of griffins in ancient Persia and ancient Egypt dating back to as early as the 4 th millennium BC. 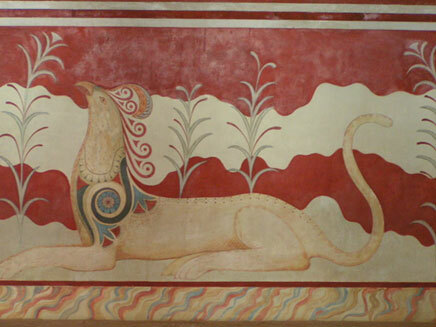 On the island of Crete in Greece, archaeologists have uncovered depictions of griffins in frescoes in the ‘Throne Room’ of the Bronze Age Palace of Knossos dating back to the 15 th century BC. 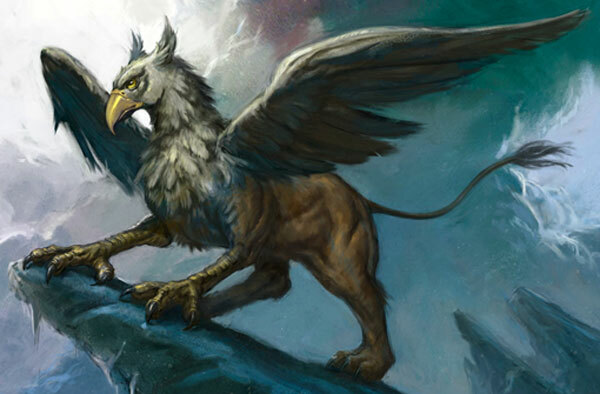 Interestingly, there are various hybrid creatures that are similar to the griffin. 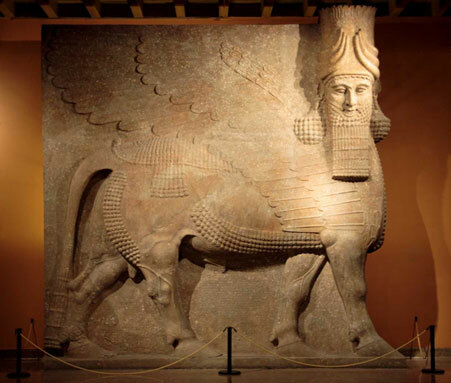 For instance, the Lamassu was an Assyrian mythical creature that had the head of a man, a body of a lion or bull, and the wings of an eagle. 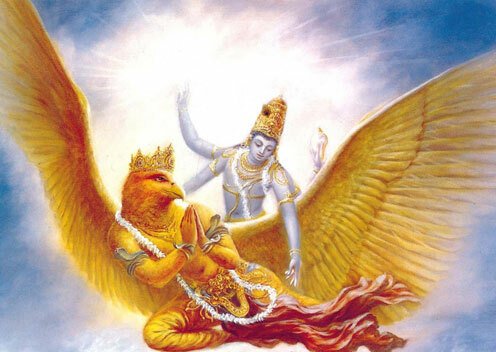 Further to the east, a part-man, part-bird creature, the Garuda, served as a mount for the Hindu god Vishnu. Perhaps the fascination with such hybrid creatures is due to the fact that it allows people to combine the best characteristics of two or more creatures into one ’super creature’, allowing meaningful symbolism to be attached to them. Hindu god Vishnu with the Garuda. Image source . This may hold true for the griffin in the Middle Ages. In European legend of this period, it was believed that griffins mated for life, and that when one partner died, the other would live the rest of his/her without seeking another partner (perhaps due to the fact that there weren’t many griffins around). This has led to claims that the griffin was used by the Church as a symbol against re-marriage. It is unclear, however, whether this was the actual belief, or just a modern interpretation. Although the griffin might seem like a creature conjured from the imagination of mankind, there might actually be some truth to this creature. One theory suggests that the griffin was brought to Europe by traders travelling along the Silk Road from the Gobi Desert in Mongolia. In this desert, the fossils of a dinosaur called the Protoceratops can be found. As these bones, especially the skull, which has a bird-like beak, were exposed on the desert floor, ancient observers may have interpreted them as proof that such a hybrid creature once lived in the desert. Yet, it has been shown that stories of the griffin have been around even before the Silk Road was developed. Perhaps it was stories about the griffin that made the traders interpret the fossils of the Protoceratops as that of the legendary creature. Regardless of its origins, the griffin has been part of human culture for a very long time and persists today, as seen in various school emblems, mascots, and even popular literature. It is likely that the griffin and other hybrid mythical creatures will continue to play a role in mankind’s imagination for a long time to come. Featured image: An artist’s representation of a griffin. Image source. For accuracy and fairness, you should cite the author and publication for the theory that the Griffin may have been influenced by ancient observations of Protoceratops dinosaur fossil. This idea was first proposed by Adrienne Mayor in "The First Fossil Hunters: Dinosaurs, Mammoths, and Myths in Greek and Roman Times" (Princeton University Press, 2000 and rev. ed. 2011). Its interesting that so many different cultures have tales of griffins.